yearly interest provides an incentive to hold for the long term. OKay so we had a fork. You guys took over with supernova and 777. From now on those are the official pools and the official chain. Sorry for all the trouble and thank you for sticking with me through this. Are you tired of useless cryptocurrencies being released everyday that aim to pump their price on the exchanges so the devs can dump their instamine? Are you tired of cryptocurrencies hyping up features that will never be implemented? 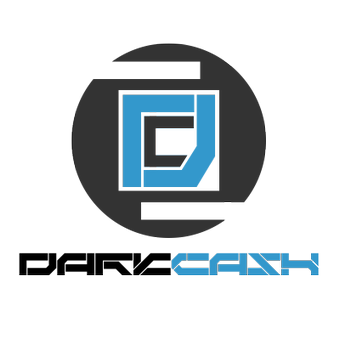 DarkCash is different, we are not going to reinvent the wheel when it comes to an anonymous transaction solution. 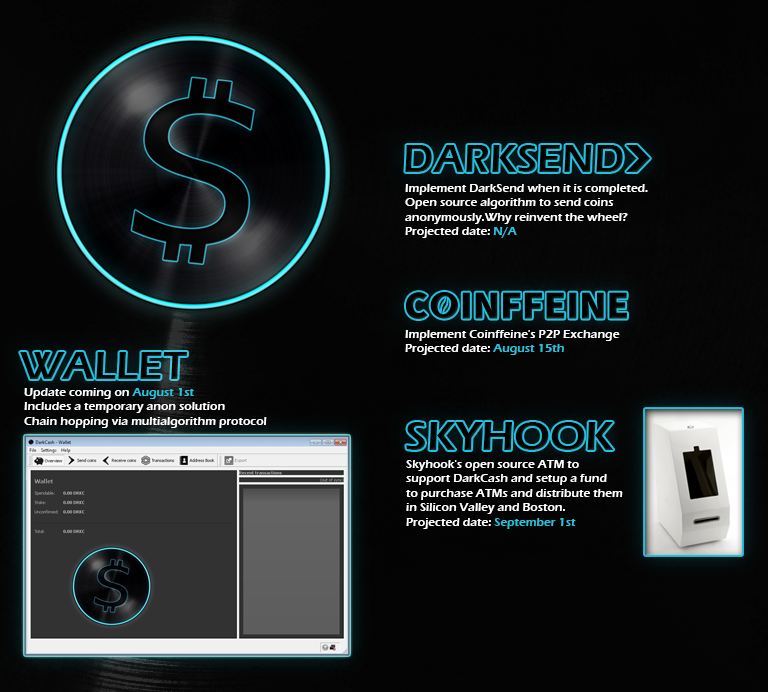 Darkcoin is a very successful currency that implemented DarkSend. The software is closed source because of security issues however it will be the first anonymous solution that will be released as open source, when that happens DarkCash will be the first cryptocurrency so modify DarkSend to fit it's POS algorithm. However, since the source is not out yet, we will be implementing a phase 1 anon solution which will include multialgorithmic chain hopping to conceal it's transactions. The idea is simple, take the transaction and hash it using X11, then Scrypt, then SHA256. There are already multialgorithm coins out there and we are using their source to implement the phase 1 anon solution. There will be a wallet update on August 1st which will include an alpha release of the feature! In order for a coin to survive it has to have demand. 99% of altcoins die after the first week of hype, DarkCash will be able to sustain it's value because it will have a real use. We started working on forking the skyhook open source ATM code which can be found here: https://github.com/projectskyhook/skyhook. We will setup 1 ATM at Stanford University by September 1st, we will also setup an ATM fund, where people can contribute DRKC to buy an ATM. Since the ATM will have a fee on the conversion, all profits will be used to purchase more ATMs which will be placed in areas of high demand (Boston, LA, Vegas, Silicon Valley) In addition to the coin's anonymity it will have a real use. Last but not least, we are also in the process of implementing a P2P exchange. We will be using Coinffeine's open source platform which can be found here: https://github.com/Coinffeine/coinffeine. Coinffeine is a P2P exchange implementation which uses a decentralized trading algorithm. Cryptocurrency is decentralized by nature, however, in this sea of decentralization there are centralized services which are powered by the distributed cryptocurrency. Coinffeine provides secure peer-to-peer transactions. Coinffeine's algorithm implements a distirbuted contract. It is also known as a micropayment channel, in this channel both parties engage in a multi step transaction. In other words, the algorithm is the escrow, after the initial commitment of the funds is completed the algorithm verifies that both parties have submitted the funds then broadcast's it to the network. Our development team will use the alpha open source P2P exchange and fork it to use DarkCash. This will enable us to offer a decentralized exchange right from the wallet. Have you noticed how there are so many different altcoin exchanges out there wouldn't it be nice if there was one main exhcange built into the coin? Well we thought so and that is why we are working on this feature. Since the code is still in alpha it will take us some time to get it developed, so the projected date for this project is August 15th. We still have to work out a few bugs and setup the wallet. Other features that are coming up, is a wallet update including tor nodes which will be released on 7/27, we did not want to launch the coin on tor nodes because we want to have stability on the network for our launch and POW phase, however tor nodes will come shortly after the POS phase. Finally, a coin release that looks promising! I'll mine this! 48h PoW and lots of promises. A pump and dump masterpiece. Can u plz update wallet? And please pool!! Wallet works, the link is just weird. I'm not gonna post anything here because people will accuse me of 'omg trojanzz!!'. what the hell? 100MB wallet? what is inside? has anyone done virus scan on win wallet? http://DRKC.pool.mn/ is up and running! Hop in! ouch diff started at 1 or what?